In The Science of Skinny, nutritionist and organic chemist Dee McCaffrey shattered the “calories in, calories out” myth by revealing that it’s processing and chemical food additives, not calories, that are responsible for our nation’s most serious health problems. Dee’s revolutionary eating plan—which helped her lose more than 100 pounds and keep them off for over twenty years— emphasizes one simple change: avoid the additives and processed ingredients. Now, Dee takes you to the next level with easy, budget-friendly “processed-free” dishes the whole family will love. With recipes for easy homemade basics such as broths, nut milks, nut butters,and sprouted grain breads, information on juicing and smoothies, plus tips for converting your own favorite recipes into processed-ingredient-free fare, The Science of Skinny Cookbook gives you all you need to enjoy a delicious, realistic way of eating—not dieting—for life. With meaty, meatless, and gluten-free options, recipes include: Fluffy Coconut Flour Pancakes, Apricot Sweet and Sour Meatballs, Pumpkin Chickpea Chili, Festive Spinach Lasagna, Mexican Ground Beef and Potato Stew, Creamy Cashew Ranch Dressing, Joyful Chocolate Almond Bars, Guiltless Grain-Free Brownies—and many more! 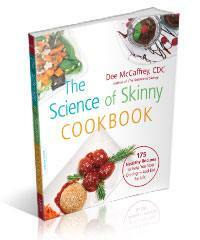 Dee McCaffrey is an organic chemist, nutrition educator, and founder of Processed-Free America. She lives in Tempe, Arizona with her husband.